Man Fights off Cougar with a Spear! A British Columbia man armed with a spear has fought off a cougar which critically mauled his partner. The attack occurred on Sunday near the couple's cabin on a remote island off the west coast of Vancouver Island. A large cougar believed to be the attacker was found dead on Monday morning. The woman, 60, was in hospital and expected to recover. An official said the attack could be the first in which a cougar was fended off and killed by a spear. 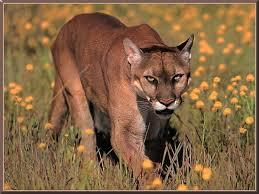 The cougar attacked the woman from behind as she was gardening near her home, according to local media reports. Her common-law partner heard her scream and rushed to her defence. The woman was airlifted to a hospital in the city of Victoria, where she was initially listed in critical condition. She was later upgraded to stable condition on Monday.